EDMI exhibited at Asian Utility Week in Bangkok from 9th – 10th June. 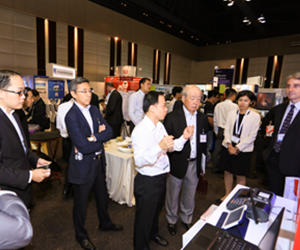 The annual conference focused on the technology strategies behind ASEAN’s largest utilities for electricity, gas, and water. 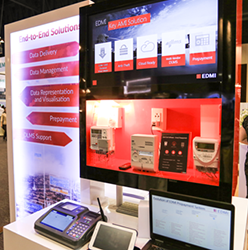 EDMI, as a smart metering solutions provider, showcased two of its most recent products, the Hybrid Prepayment Solution, developed to meet the increased market demand for prepayment in some of South East Asia countries, and the Cluster Metering Solutions that could reduce non-technical power losses and meter tampering. Prasitchai Veerayuttwilai, Executive Director of Asia, Africa and America had the opportunity to be a speaker in the event and shared EDMI’s global deployment experiences indicating the business values achieved through various EDMI’s solutions. 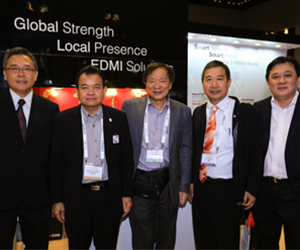 During the 2-day event EDMI welcomed guests, stakeholders as well as key customers from Asia and Africa. 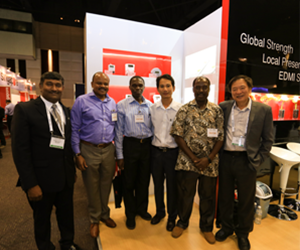 This was a great opportunity for EDMI to network with them and boast the latest and innovative impressive metering solutions in the market.